Falstaff Minuetto; Giuseppe Verdi; guitar. Falstaff was Verdi's last opera, written when he was pushing 80. Out of a total of 26 operas, this was only his second comic opera. (The first one came early in his output, and was not a success.) Falstaff is universally considered a masterpiece - one of the three or four greatest comic operas. You'll thank yourself for digging in one day. You will find that it's not one of the old-fashioned "number" operas - those with distinct arias like La Traviata or Rigoletto. The music of Falstaff romps along brightly, changing character continuously to reflect whatever is happening. This minuetto, as nice as it is, cannot be considered characteristic; do not expect two hours of Johann Christoph Friedrich Bach! The premiere of Falstaff was in Milan on February 9 1893. It's interesting to note that the copyright date of the guitar arrangement is the same year as the first North American performance of the opera, in New York in 1895. I wonder if Ms. Luigi saw it in either city. I can't tell you anything about her except that four other pieces by her in my collection are original compositions, and that her name appears as "Amelie" on pieces published in 1895, and as "Amelia" in 1897. The minuetto comes from the very last scene of the opera. Falstaff the opera is based on Shakespeare's Merry Wives Of Windsor. Sir John Falstaff is the rascally, vain, old "Fat Knight", and in the last scene he receives a well-deserved humiliation. He is told that he can meet Ford's wife Alice secretly at the haunted Herne's Oak, but of course it's all a set-up. The other characters show up dressed as elves, fairies and imps, and they frighten poor Falstaff half to death. He finally figures out what's going on, but not until after he's learned his lesson. Then, on the spot, there is a quick wedding ceremony for two couples, everyone still wearing his or her disguise. This Minuetto provides the background music, and when it is finished, blustery, old Dr. Caius lifts the veil of his new wife, assuming her to be the young and pretty Anne Ford. You can imagine his shock and disgust when "she" turns out to be one of Falstaff's smelly, red-nosed, drinking buddies! The "merry wives" had fixed it up so that the second couple was Anne and the young gentleman Fenton, thereby foiling Mr. Ford's plans to match his daughter with old Caius. It may interest guitarists that Verdi wrote some lute music for the opera. In Act II, scene 2, Alice Ford takes up a lute and plays it as Falstaff shows up at her house for their first secret meeting. That one was a set-up, too, and poor Falstaff ends up getting dumped out of a laundry basket, through the window, and into the sewer below. Below: Minuetto from Falstaff, arranged for guitar by A. Luigi. I thank the Library of Congress again for making its music collection so easily accessible. This easy-to-read tablature is completely faithful to A. Luigi's published transcription in music notation. It uses only common keyboard characters - no graphics. It's very simple and instantly usable - almost. 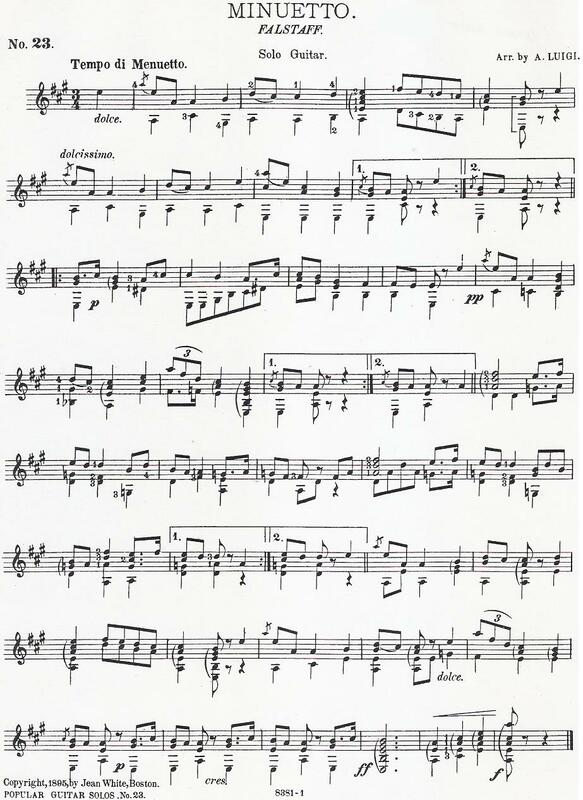 After printing out, you will need to add a few slur marks and neaten up a few other symbols, but that effort is negligible in the big picture of learning and playing a new piece. Click here for some general comments on the modern tablature, including tips on printing it out perfectly. Source:    Popular Guitar Solos; publ. Jean White, Boston. Grace notes: Fret numbers without stems are grace notes. 1 7 12 17 22 27 32 37. Last measure is 42. Minuetto (Falstaff)                           FALS: Page 1 of 1. EADGBE  Tempo di Menuetto. Leading measures: 1 11 19 27 36. Giuseppe Verdi. Helpful keywords not in the main text: amelia luigi; women guitarists; female guitarist; william shakespeare; william shakspere.